Both signed: Lalique France. No Lalique box. Pair of large frosted cats, one sitting and one crouching. Lalique France Clear Frosted Crystal Cat Figure 8-1/4" Tall Sitting Cat - #11603 "Chat Assis" Excellent Condition: Very minor cosmetic wear, as expected with careful handling and display, such as minor shelf wear to bottom, residue from sticker on bottom, etc. Retains an original tag on bottom. Felt pads adhered to bottom for protection, one is missing. Please see detailed photos below for item condition.., . It has a chip on one side, see all photos for details. All photos are from actual item. Still displays beautifully. This piece is in EXCELLENT CONDITION. Acid etched “Lalique France” on underside (see photos). A perfect gift for the cat lover in your life or a terrific piece to add to your collection! Genuine Lalique crystal. About Lalique. Made of lead crystal. Signed on the bottom: Lalique France. Solid Crystal Clear Glass of a Cat with her paw up. Cat is sitting on a Solid Etched Glass Cube. In Excellent condition and still with white felt pads to protect the bottom of the glass. Lalique Crystal Frosted Bison. Acid etched "Lalique France" on side of base. Features a bison with head down. Frosted body (clear head and fur) with clear base. This is a good size and very weighty piece. It is in excellent condition with a tiny flea bite chip at base, see last photo for details. Otherwise, it is in excellent condition. Bottom has four felts to protect its surface. 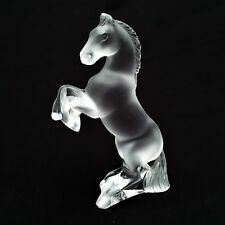 Rearing Horse by Lalique. This rare edition stands 4.5" tall and is frosted to clear. This beautiful piece of Lalique is in excellent condition, with the exception of a small circular cracking, which may be a defect or from an impact; I'm not sure as there is no chip. SIGNED LALIQUE CRYSTAL OWL CLEAR FROSTED CHOUETTE PAPERWEIGHT w/ ORIGINAL LABEL ~ 3.5". very good no chip - no crack. Ask for Abby or AJ. -- Crystal is frosted. “Master jewelers for seven generations.”. Reference number : 1217200. The item pictured is always the actual item for sale. Our photographs are taken in-house at Zadok Jewelers by Zadok staff. This is Lalique's Gregoire Toad signed and in Excellent-PLUS condition. Originally designed by Marc Lalique in 1973. All pictures are from the original Toad. 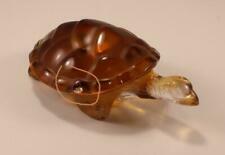 LALIQUE CRYSTAL CLEAR GREGOIRE TOAD FROG FIGURINE SIGNED RARE COLLECTIBLE RET. LALIQUE CRYSTAL CLEAR GREGOIRE TOAD/FROG. BEAUTIFULLY DESIGNED IN CLEAR AND FROSED CRYSTAL. QUITE RARE AND RETIRED. BASE MARKED WITH ENGRAVED SIGNATURE. CLEAR GREGOIRE TOAD/FROG. History of LALIQUE Crystal . Lalique "Tambwee" Lion Cubs. Signed On Bottom: Lalique France. This is an adorable little piece. Signed Lalique. There are no visible flaws. No box or paperwork is included. Lalique Signature on the side near the back legs. Design Pig. Fair - Moderate wear and has condition issues that may or may not be repairable. Good - Moderate wear and is fully functional. Very Good - Evidence of wear and handling with no major flaws. There are pads on the bottom of this adorable panda as it was displayed. It is in excellent condition. Ask for Abby or AJ. -- Crystal is clear and frosted. The item pictured is always the actual item for sale. Our photographs are taken in-house at Zadok Jewelers by Zadok staff. The only detail altered in any photo is to hide the serial number of the item. Lalique Crystal Tancrede Cheetah. This is a huge heavy piece. It is exquisite. Signed Lalique. No box or paperwork is included. Free shipping to US addresses including insurance. Lalique Style Number 1164000. Gregoire Toad. by Lalique. Excellent Estate Condition. This small bengal tiger is beautiful. Hear No evil, See No evil, Speak No evil. a great desk set from Lalique Crystal. Made in France. THREE WISE MONKEYS SCULPTURES. 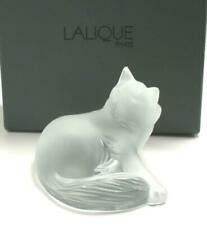 Lalique crystal frosted cat on clear crystal base, signed. It is 6.5" tall. It is signed “Lalique France” on the bottom. Condition : Very good used condition. Shelf scratches on bottom of base and a small chip on the back corner of the base. We respond quickly. Style Number 11750. More than just a pretty picture. Major flaws/issues will be noted. Fair - shows moderate wear and has condition issues that may or may not be repairable. Lalique introduced this set in 2016 to celebrate the Year of the Monkey (Product #1064800). They are still available in the current Lalique product line. Lalique's legendary quality is apparent. These are the three wise monkeys from Chinese astrology. Lalique France Clear Frosted Crystal Cat Figure 9-1/2" Long Crouching Cat - #11602 "Chat Accroupi" Excellent Condition: Very minor cosmetic wear, as expected with careful handling and display, such as minor shelf wear to bottom, residue from sticker on bottom, etc. Felt pads adhered to bottom for protection, one is missing. Please see detailed photos below for item condition.., . Style Number 11730. Lalique Crystal Rhinoceros Rhino. Major flaws/issues will be noted. Over 100,000,000 served. Excellent - shows very minor evidence of handling. Excellent Condition. Fair - shows moderate wear and has condition issues that may or may not be repairable. Perky and mischievous, this adorable little rabbit, with it's smooth coat, are sculpted in satin-finished crystal. This piece is the perfect gift for any Lalique collector or bunny lover. 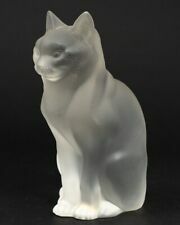 Lalique crystal frosted cat on clear crystal base, signed Lalique 3.13.91. Very good no chip - no crack. It is great gift for any Lalique lover as well as an excellent addition to any crystal collection. CLEAR MOUSE SEAL SIGNED. This crystal deer (fawn?). is frosted on a clear, rectangular block base. The animal appears to be grazing. The piece is in excellent condition. LALIQUE CLEAR & FROSTED CRYSTAL LARGE POLAR BEAR. Lalique Glassware Category Origin: France Maker: Lalique. Signed with an engraved script signature - Lalique, France. Original Type: SCULPTURE. SCULPTURE #11637. Lalique Crystal Figurine 1165200 Zeila Clear Panther Sculpture 14 3/8"
Nimble and sensual, she approaches stealthily, preparing for her attack. Her slim silhouette is enhanced by powerful muscles covered with crystal fur sculpted by thousands of luminous spots. Designed by Marie-Claude Lalique Crystal, the Zeila Panther embodies the feline strength and grace.